Macgo iPhone Cleaner for Mac comes along with its major update earlier this week –free beta version has been upgraded to the official full version. And another great news for Macgo iPhone Cleaner fans is that the official version has $10 discount now. The full version can run on Mac OS X 10.10 Yosemite, which is the latest version of Mac OS, and 10.9Mavericks / 10.8. The official version is also compatible with iOS8/7.1.2/6/5. 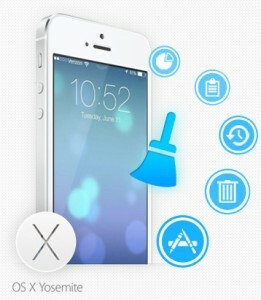 Macgo iPhone Cleaner for Mac is the first cleaning utility for iOS8 on Mac. The recently updated official version of Macgo iPhone Cleaner for Mac enhanced the cleaning speed and stability, which is great news for users who want to delete multiple junk files at one time. The full version has recovered a series of bugs based on user feedbacks. The updated Macgo iPhone Cleaner for Mac enables users to clean junk files with no efforts, and it will export all the files on iPhone to computer, in this way the users could view them on computer, so that they can select which one is useless and occupies a lot of space and should be deleted. Users could worry less about the efficiency of Macgo iPhone Cleaner for Mac, because this software was designed to scan and clean almost any kinds of junk files on your iPhone devices. The advanced technology can keep the important system files but dig out all the useless files like temp, cache, cookie, off-line, corrupt and forgotten files, and many other kinds of junk files. Even the redundant app crash logs in the user’s iPhone would be thoroughly cleaned out. The cleaning efficiency is surprising and dramatic, the user will reclaim up 40% – 60% storage space. Just go to download and try it now. Macgo iPhone Cleaner for Mac is available now at $29.95. Copyright © 2011-2017 Mac Blu-ray Player.